It is a small world .I also attended Barnes Rd. at about that time. jlb wrote: My family lived at 61 Taylor Street from the early 1900’s until the property was demolished in 1960. I have the census record for 1911 showing my grandparents, Joseph and Mary Bedlington, and their children, including my mother aged 7, living at the address. As a child I lived there from 1950 until just before its demolition. Redpath’s shop, mentioned by ‘GeordieRoots’, was only a few doors away from our front door. I was really hoping to find some photographs of the street as I remember it but have so far been disappointed. I do have a rather depressing photograph of the property as it was being demolished, but it’s not how I want to remember it. 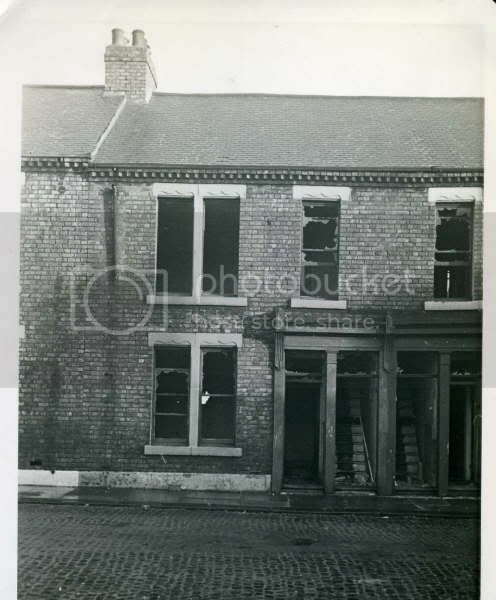 In my previous post I mentioned I had a photograph of 61 Taylor Street as it was being demolished. It’s a depressing sight, but now I've finally figured out how to attach a photo’ to a post I thought I'd share it. Our front door is second from the left. You can see the stairs going up to the flat. My recollections of it come from the early 1950’s when it was my home for the first seven or eight years of my life. The front door opened onto steep stairs leading up to a landing. There were two rooms at the front which looked out onto the street; a small bedroom over the stairs and a room that I knew as the ‘lounge’. At the rear there was a living-room, with a second bedroom adjoining it; both overlooking the backyard. One or two steps down from the living room was the ‘scullery’, which I recall as having a gas cooker, a pantry and a sink with just one tap that supplied only cold water. Stairs from the scullery led down to the backyard where there was an outside toilet - kept frost-free in winter by a small paraffin lamp - a coalhouse and a washhouse. The door from the yard led out onto the back-lane that ran between our street and the rear of Eldon Street. The back-lane was our playground for football - ‘doors’ - and cricket - the wicket was a dustbin lid supported by a brick. Lots of memories from that time in my life. homesick wrote: It is a small world .I also attended Barnes Rd. at about that time. See Mr Leslie passed away a few months ago. I wonder how many ex pupils went to his funeral? He scared me to death. Had many a sore back-side.He used to play a tune with the cane and took great pleasure in it.Does anyone know if Mr Galley is still alive? He was a real gent. 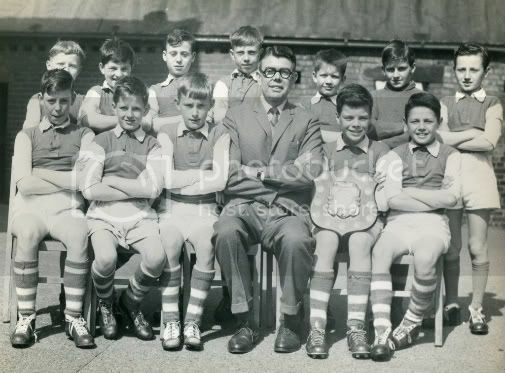 Mr Galley has been mentioned by some of you and so I thought you would like to see him with the Barnes Road Junior School football team that he was involved with during my time at the school. The photograph would have been taken in about 1961/62. I cannot remember what the trophy was for but we all look pleased with ourselves! Excellent photo, the trophy was the Division Two Championship of the primary schools league in Shields. The lads from the 3rd year who made up the team the following year got relegated straight away. Is MR Galley still alive? Following up an initial posting some years ago by Geordieroots. A British family that I am researching has 83 Taylor Street, South Shields, as their intended address on their arrival into the UK from Buenos Aires in 1937. This is also the address that the head of the household, Alexander Irvine, gives as his address some years earlier, around about 1910 to 1915, when he was applying for his various master mariners tickets. I note from other emails on this list that there was a family called Ramsay living at this address as well. Alexander's wife was Rebecca Ramsay Irvine, so seems possible that her maiden name was Ramsay and she kept this as part of her name when she married. Their daughter was Margaret Ramsay Irvine. Any further information would be welcome. Many thanks in advance if anyone is still following this email thread. Ramsey is an old Tyne pilot name and they often used their mothers maiden name as a middle name.